“And in the same region there were shepherds out in the field, keeping watch over their flock by night. 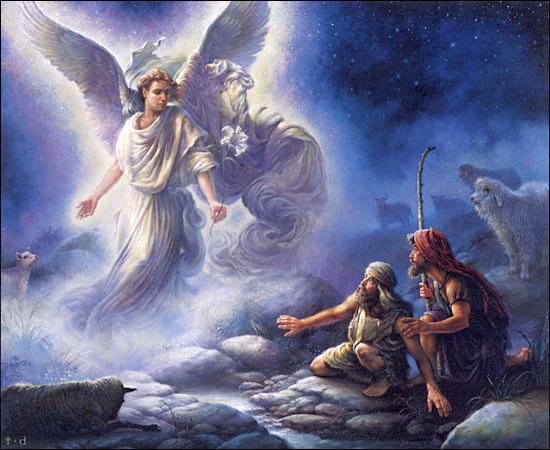 And an angel of the Lord appeared to them, and the glory of the Lord shone around them, and they were filled with fear. Let us join with the heavenly host and sing of our salvation, our peace, and the good will that was lavished upon us the night our Saviour was born! Wishing you and your family a most blessed Christmas! Thanking God that because of Jesus, our Saviour, we are sisters!!! Have a very blessed, God-glorifying Christmas, Christina!! Thank you so much Persis. And, I pray the same for you and Lydia! Wishing you were closer to join us for dinner tomorrow! It’s CHRISTmas morn and all’s still quiet while I catch up on your beautiful blog, and I can’t think of a better way to start this blessed day than with the words of these verses! Love and blessings on this most special day! Merry CHRISTmas my dear friend and sister! Blessing God with you for the gift of Jesus, our salvation! Love and blessings to the Hefner clan! Thankful that in Christ, YOU are my sister!!! Wishing you a Blessed Christmas. Mike and I attended our Christmas Eve Vesper Service last night and Mike is always is asked to read the Christmas story from Luke. What it must have been to be there on that night. Those humble shepherds were BLESSED!!! And, I am blessed that in Christ, we are sisters and that we celebrate the gift of our salvation, Jesus Christ!!! Love and blessings to you and Mike! Christina, I pray God will fill our mouths with His praises every single day of this coming year! I am grateful because of HIM we can come together, no matter how far we are from each other! I love it! Good Stuff! Happy belated Christmas Christina! I’ve been on blogcation with all the holiday busy-ness. Isn’t it great being a Christian? We get to keep on celebrating Christmas year round!